The lives of the people of the Diocese of Erie come alive in the storytelling published by nwpaCatholic.com. 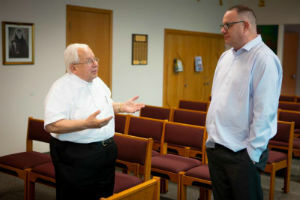 These feature stories provide an in-depth look at parishioners, clergy, religious, teachers and students, and all of those working in various ministries of the Catholic Church in northwest Pennsylvania. Their lives, and how they intersect with the current issues of the day, inform these stories. Gannon students spend a week in Erie helping to build Gannon’s new St. Joseph House of Faith in Action. Athletes from Catholic schools in the Diocese of Erie do their best on and off the field.